Proteus Instruments will be exhibiting at WEFTEC 2018 -the largest water quality exhibition in the world. 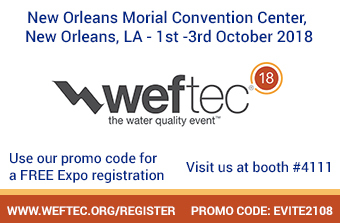 The WEFTEC exhibition takes place between the 1st and 3rd October at the New Orleans Morial Convention Center, Louisiana. ��Proteus Instruments are exhibiting at booth 4111 where there �will be experts on hand to discuss your applications and provide technical advice. here by using the promo code: EVITE2108. The US launch of the Proteus � the world's first scientifically proven real-time sensor for measuring BOD at booth 4111. Discover the Newest Innovations and Solutions.�WEFTEC is the largest water quality exhibition in the world. With over 1,000 exhibiting companies, WEFTEC is your chance to be introduced to the most cutting-edge technologies and the best technical experts. Access Global Business Opportunities.�WEFTEC is your gateway to global water, wastewater, and resource recovery � and is the only water show selected to be a part of the U.S. Commercial Service International Buyer Program. Make Valuable Connections.WEFTEC hosts more than 20,000 vistors from around the world and all sectors of water quality. Take advantage of opportunities to network with leaders in the field, as well as fellow registrants spanning all areas of the water quality sector. Additionally, more-focused events and sessions will help you connect with others seeking ideas and solutions in your topic area. Stay Competitive in and Relevant to Your Profession.�Attend the highest-quality, most comprehensive educational sessions available, featuring papers meticulously selected through a rigorous process that includes abstracts reviewed by an average of nine topic area experts. Bring Value to Your Company.�WEFTEC features everything a water professional needs to see, learn, hear and experience at one event.